‘The herbicide’s main ingredient, glyphosate, sticks very strongly to soil, dust and hard surfaces and hangs around for several months after it has been sprayed,’ Dr McGrath said. ‘During the first few rainfalls, the runoff will leach into local drains, streams and rivers. Nedlands technical services manager Mark Goodlet said the City would be complying with the Australia-wide industry standard practice for weed control when it commenced spraying herbicides on its hard surfaces in October. ‘Herbicide products that include glyphosate as the active constituent include Round-up, Zero and Defender which are readily bought over the counter,’ Mr Goodlet said. In 2010, Dr McGrath co-presented a workshop on pesticide leaching that identified potential impacts of weed killers such as contamination of drinking water, dermal contact, inhalation of spray drifts and environmental effects. He said Nedlands residents should put pressure on councillors to make responsible, educated decisions regarding weed control. ‘The way herbicide regulations are framed is that the person who applies the chemical ” usually a local council worker ” has to do the risk assessment, but often they are the least informed or able to properly assess the risks,’ Dr McGrath said. 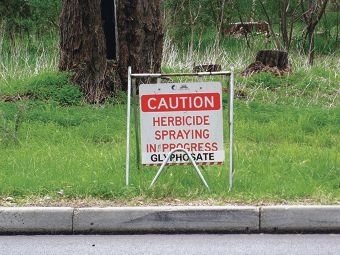 A WA Department of Health spokesman said using glyphosate in accordance with label directions was considered low-risk and was used by home gardeners across Australia. ‘It is a schedule five pesticide and is low in toxicity to mammals,’ he said. Pesticides Action Group WA founder and Nedlands resident Alex Jones said she was disappointed the City was reverting to chemicals. ‘Our Government has introduced laws to protect us from passive smoking, yet is willing to promote the use of herbicides on public land and effectively poison its environment and people,’ Ms Jones said. ‘It’s about the cumulative effects because the chemicals get into the air that we breathe and of course into our waterways.